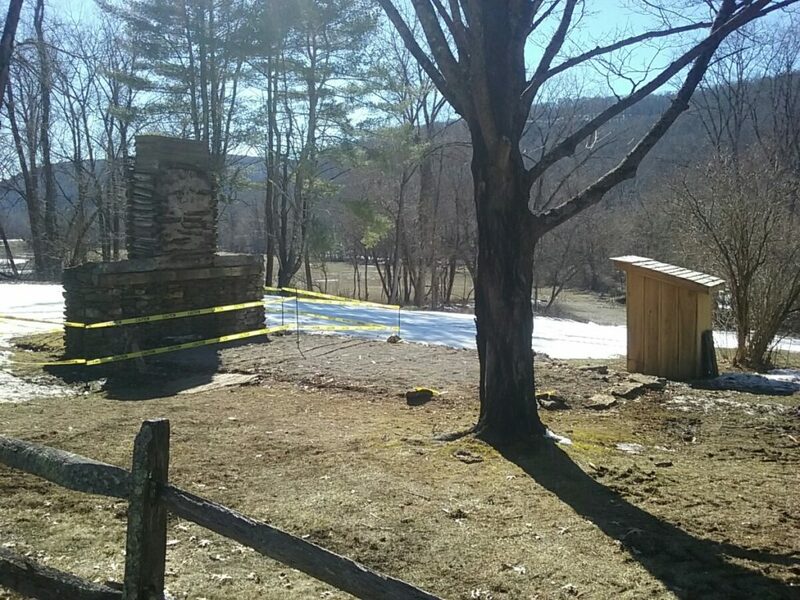 What Happened to the Noah Blake Cabin? A lot has transpired over this past winter and we have learned much about the origins of the Noah Blake cabin. What we have learned has informed an exciting new path, one that will allow us to build the Noah Blake cabin as Eric Sloane originally intended and illustrated in his 1962 Diary of an Early American Boy, Noah Blake: 1805. 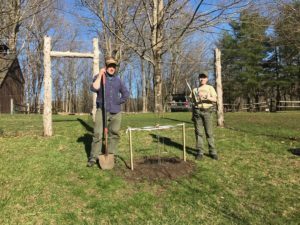 This father and son team stopped by the Noah Blake Orchard on the grounds of the Eric Sloane Museum on Earth Day and – presto (that’s Italian for a lot of hard work just happened!) – we have a new Westfield-Seek-No-Further tree to replace the one that died. With all of our gratitude, THANK YOU Darrell and Aiden Cherniske! We’re happy to share what we have found, and continue to find, inspirational or just plain interesting. Doesn’t get much more hip than this. Diana Ross (right), Florence Ballard, and Mary Wilson, known collectively as Diana Ross and The Supremes at the time of this photo, c. 1963. These three talented ladies are each holding the Polaroid Automatic 100 Land Camera. Edith’s take: To me this camera is easier to use then a digital camera. Although the foucasing is hard and its hard for the person posing to not move, however you get your picture somewhat instant. In modern cameras today you may have to wait days to get a picture printed, but with polaroids its thirty seconds to a minute! That is what is great about these cameras! We have had several fun days taking pictures at our farm! Edith’s Dad’s take: When Edith and I created this site, we chose to include tools as an inspirational category, as we sometimes find tools that inspire our creativity, or simply make life more enjoyable. I think the older Polaroid cameras do both for us. The technological history of the Polaroid camera is fascinating. When I was a younger soul, the Polaroid had devolved into a cheap, semi-instant gratification novelty with results to match. Yet in it’s day, the Polaroid Automatic 100 Land Camera, while still perhaps a novelty, was a serious piece of equipment. It sported a fully automatic exposure metering system, utilized pack film, and was a substantially made piece of photographic equipment with a 3 element glass lens, metal body, and a parallax-corrected viewfinder. They were, for the era, an expensive camera. Getting used to a Polaroid can be tricky as it is completely analog and is also, to say the least, quirky. At it’s worst it can prove frustrating, though in our experiences this frustration is due to issues with the film, not with the camera. At it’s best, the photographs are acceptably sharp, though it really is in it’s element with portraits. In addition to the camera’s technical abilities, we find the camera inspirational and unique for other reasons. One is the light and color quality produced by a correctly exposed color print, yielding an almost ethereal quality. In addition, the camera evokes some unique and great responses when it is brought out. Sometimes, these reactions foster conversations that are just plain fun to have. These conversations are fantastic “ice breakers” that open a wonderful opportunity to photograph people. The camera has this great quality of putting people at ease – and that is it’s greatest attribute. Edith’s take: Mondragon Bookstore is one of the most unique bookstores I have ever been to. Ranging from biographies to cook books to children’s books for all ages, to even music and a whole lot more! There selection is almost endless. Every time I go in, I always come back with something. There is something about walking into a book store with a classic twist, this describes Mondragon Bookstore. When I walk in I’m greeted by familiar smiling faces, which makes my experience even better. I would recommend Mondragon to book lovers and children – I guarantee you will come out with something you find interesting. Perhaps a novel or a CD that you have been dying to get but can’t find anywhere else! Dada’s take: Mondragon Bookstore was created as a cooperative of sorts, but has transitioned lately into a more standard economic model of an owner/operator managing the store. I think that the original concept is inspiring and the bookstore continues to be a unique offering on Lewisburg’s Market Street. Like Edith, I nearly always find something of interest to purchase. As a voracious reader and dedicated recycler, the concept of a used bookstore is an appealing one for me. It is not only a unique destination, but one that rewards the explorer with a great experience and purchases of lasting value. Few would argue over whether the Susquehanna River can be inspirational. From the reflection of the panorama of a morning sunrise, to the river’s appearance during an approaching Southerly storm (where the whitecaps formed by a stiff wind can make the river appear to be flowing in reverse), the Susquehanna River is an integral part of life in Lewisburg. Cursed at high water, enjoyed when calmed, the river has a life of it’s own. Our inspiration is found most often in boating. Several years ago I purchased a 17′ aluminum canoe, unsure of how comfortable the thing would be. After several seasons on the water, Edith and I have grown quite fond of “the battleship”. The canoe is incredibly stable, is rated to hold 750 lbs. of people, pets, and gear, steers straight as an arrow, and feels incredibly safe no matter the weather. There is a joy to be found in living near the river, with the river. One of the greatest is to live close enough to the river to be able to walk to it toting a canoe or kayak. Our two favorite journeys? A hard paddle to May’s Drive In for an ice cream reward (remember an extra pair of boots) and an 8:30 p.m. trip the night of the Lewisburg fireworks display the Friday before the annual 4th of July parade. Edith’s take: It’s no question that it is truly magical to go canoeing across Susquehanna river. I find it fun, interesting and exciting all at the same time. There is something about paddling around in the water that brings such joy to me! It is truly a fun and rewarding to do. Then there is also the occasional must-do of stoping into May’s to have a ice cream treat or perhaps a bite to eat. Its scenic beauty is breathtaking as well as good exercise to the person paddling the boat. Edith’s Dad’s take:. 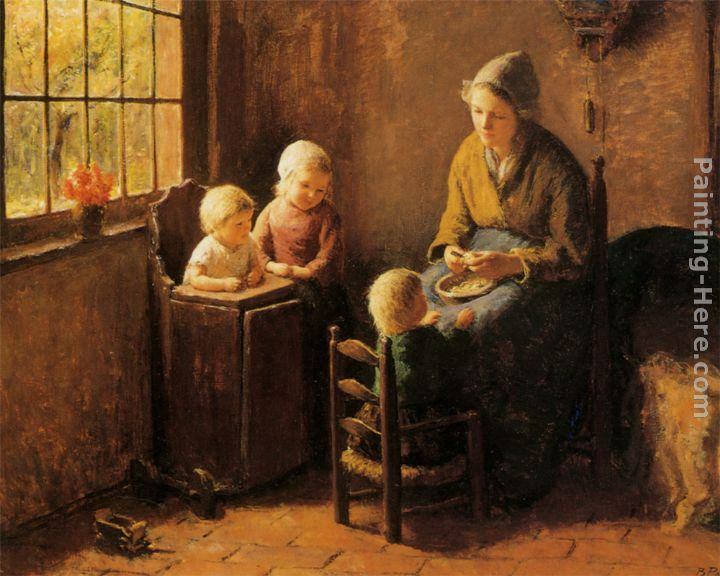 Mother’s Day Sunday past has reminded Edith and I of another of our inspirations: mothers. Thank you. I don’t recall seeing a phenomenon quite like this one before. From what I can gather, this is a meteorological case of “iridescence”, which seems to me to be a fancy word for light which is passing through water droplets or ice crystals in the upper atmosphere. It is not clear to me how this is different from what causes the traditional forms of rainbows, but the “rainbow” in our photograph has a distinction of being “iridescence”, not strictly a “rainbow” (which is, I assume, because it is not curved like the traditional rainbow). Edith’s take:. We had a very interesting experience the other day, when we saw what looked like an upside-down rainbow, we figured out that this was called an ” iridescence”. It is was really cool!!! It showed several pretty colors including: yellow, orange and a blue-green [ aqua-ish color]. It was certainly magnificent in the early evening sunlight, above the lush green mountain across the road from us. The ” iridescence” is sunlight coming through water droplets or “ice crystals”. It was a very unique experience, since I have never seen this type of thing in my life, the only thing closest to it is a “rainbow”. Edith’s take: Sledding is so much fun, especially on a cold winter day when it has just snowed! The hill is not just good for sledding, its good for snowman building, snowball fights and making snow sculptures and snow angels. The thing I most love about the hill is sledding down it during the night and seeing stars if it is a clear night. If you are looking for a good sled, I would suggest going to Cole’s Hardware if you live in Lewisburg. They have a large selection of sleds and other outdoor gear. A fun sled is the small sheets with handles, they are certainly for a daredevil!!!!!! The other nice thing is there is a small hill and then a larger hill with a bump. Once my dad and I were going down the hill with a bump in a wooden Flexable Flyer and we broke it, thats how much of a bump the hill had!! The smaller hill is a smoother, shorter ride, but it is fast!! We go sledding so much that we ripped the bottom of our old sled! Edith’s Dad’s Take: When I was younger, sledding was magic – especially at night. Did you know that falling snow makes a sound you can hear if you listen intently enough? The sound, too, is magical. Have you ever heard children sledding at night on a distant hill? You guessed it – magic. Our favorite spot is Jim and Betty Lou McClure’s. Believe it or not, this was once the location of tennis courts for Bucknell. They were real grass courts, and the brick pillars were used to string netting to keep the tennis balls inside the court. Spectators sat on the surrounding hills to watch matches, hence why the hills themselves have almost a stadium-like feel. The land is no longer owned by Bucknell, but by the McClure’s. Sadly, Jim passed away in 2010. Jim had a sharp wit and I once told him, as we stood watching some children sled down his hill, that I thought it ironic that a Federal Judge had such an attractive nuisance on his property. He didn’t skip a beat in telling me that, while it might be argued that he had an attractive nuisance, the pleasure he derived from watching kids have so much fun sledding outweighed any risk of suit. He believed that, and he was a great guy. Edith’s take: This was the best homeschool field trip ever! We took the American Girl Felicity in search for where they filmed the movie, we were disappointed to latter find out that the movie was filmed in Canada. However, we reaserched a woman that was the inspiration for Felicity. Her name was Martha Everard and we found the house she lived in. They showed us though a guided tour- the house was beautiful both inside and out. Edith, Beth (holding Felicity) and a tour guide before our tour of the Brush-Everard House. We also received a ton of compliments on the doll. We stayed in one of the houses, a small two story one on Duke of Glouster St., it was a small two story home with three beds, two twin and the other king. We had a peaceful un-disturbed stay and they came on whatever night we asked and lit a fire for us in our fireplace! “Our” house, which was delightful and made our stay in Williamsburg more magical. We went down to the hotel and had breakfast and then strolled around, greeted by many people in authentic 18th century clothing. This was a very cool stay and certainly not your everyday hotel!! Edith and her Mom taking a break from the historical tours to enjoy some ice skating in Williamsburg. Edith’s Dad’s take: I thought that Felicity: An American Girl Adventure was a creative adaptation of what a girl of privilege might have experienced in Colonial America. Searching for the real Felicity, however, proved to be much more exciting. The wonderful people who administer, work, and demonstrate in Colonial Williamsburg help you to feel more immersed in the history of the town and it’s people. Of course, nothing is more inspiring than a cold evening in a 4 poster bed in front of a fire…. For a bit of Early American inspiration, it is difficult to beat Colonial Williamsburg. Edith’s take: Little Free Library is a 501c3 non-profit organization committed to giving books to children who may not have any at their house. Anyone can, and is encouraged to, take and/ or donate any book they want. We have a box in town Lewisburg on Market Street in the front of First Baptist Church. I think Little Free Library does good things because it does not only donate books to people that don’t have them and may not have the money to buy them, but it encourages readers. The website says they have over 80 countries using the “system”. I encourage people reading this to go to the link and watch the video on that link, the video tells more about what Little Free Library is and its purpose. You can buy a Little Free Library box or your town can buy one and have it sent to your community. Its truly a great thing and we encourage people who have this box in their town to donate books that you have no use for anymore. Is your old Rachel Ray cook book collecting dust? Have you ever read that novel more then once? Does your child have any books that is not their reading level or they are no longer interested in? Donate them to Little Free Library! You will feel great about doing it and it will support a charity! Edith’s Dad’s take: The Little Free Library Organization, and the steward for our local Little Free Library, The First Baptist Church of Lewisburg, have collectively earned their place in our list of inspirational places in Lewisburg. We are grateful to the First Baptist Church for serving as a steward for the Little Free Library, and grateful for the folks at the Little Free Library Organization for developing this very important initiative. Thank you! Edith’s take: When most people think of cemeteries they think of horror movies. This cemetery is not like that, the cemetery is located just a few yards from West End library in the driveway. Its ashame, the cemetery there is not very well atended to, most of the grave stones are rolled over and worn with age. Some of the graves date back to the early 1800s. Around several various graves, a fence is around them, most although very old are quite beautiful, some with lovely flowers and other beautiful patterns. Dada’s take: I’ve always loved cemeteries, especially ones that are small and off the beaten path. When I lived in remote area of Berks County, Pennsylvania, I was struck by private familial cemeteries on the old farmsteads in and around such towns as Kempton, Stony Run, and Eckville. I often feel a profound reverence, a desire that swells within me to be respectful, to learn what I can from the monuments, the names, the dates, the epitaphs. It isn’t born from an interest in genealogy, nor history as they relates to graveyards, but from a desire to try to know and understand something – a very small something – about those interred. This has been sung by many, but perhaps found in it’s most moving form (in both the singing and in the playing) with Béla Fleck & Abigail Washburn. Edith and I spent some time this afternoon in a cemetery (before you wonder aloud, no, this would not be the first time we spent an afternoon or morning in a cemetery, a very instructive place to take a child). This tiny cemetery, possibly just the remnant of one, sits under some trees adjacent to the West End Library for Union County. There are many beautiful, Victorian-era markers, some with ornamental iron fencing, and there are nearly an equal amount of pre-Civil War monuments if you are a dedicated seeker. Edith’s take: This is the most interesting public library I have ever been to. They actually are not just one library, they are three. They branch out into Union County, Mifflinburg (Herr Memorial) and Laurelton (West End). Each one has its special differences, my favorite is West End in Laurelton. They all have both a nice children’s and adults section of books, audio books, magazines and more. The even nicer thing is that if you return something from Mifflinburg at Union County you can have it returned to Mifflinburg and this is true of all books from all places in the Union County library system. I have favorite library books that I want to share with you that perhaps you or your kids can read: Tuck Everlasting by Natalie Babbitt, Island of the Blue Dolphins by Scott Odell, The Selected Letters from Laura Ingalls Wilder by William Anderson and I am a Cat by Soseki Natsume. All of those listed are my absolute favorite library books! I hope you find these libraries interesting and fun. Edith’s Dad’s take: Public libraries are a foundational stone of our democracy. Every community – no matter rural or urban – deserves a public library. The Union County Public Library System serves the needs of our community, and extends it’s services to include events, programs, and even gallery space for local artists – for these reasons, it makes our “Inspiration List”. Of the three, the West End Library is my favorite. Edith and I decided that there are so many reasons why it is our favorite that we intend to devote a daily inspiration post just to the West End Library. Edith’s Take: Dovecotes are very pretty and unique structures meant to house pigeons and doves. Some dovecotes are very simple like this one. In some cultures the possession of a dovecote was a symbol of status and power. The reason why we got stared on dovecotes as an inspiration is that my dad actually built his own dovecote which is now hanging on our non functioning brick outhouse. It looks very pretty there and my dad even added his own touch by including a little mini arbor to hang our large rose bush on, he also added a little red painted heart in the center, which I think really adds a nice touch to our dovecote. It is really very cool that we have our own dovecote as I do not know of another one in Lewisburg, at least not one attached to an outhouse!!!!!! Edith’s Dad’s take:. Thanks for your kind words, Edith! I had a lot of fun with this project. The entry holes are a smaller diameter and different shape than those of a traditional dovecote. 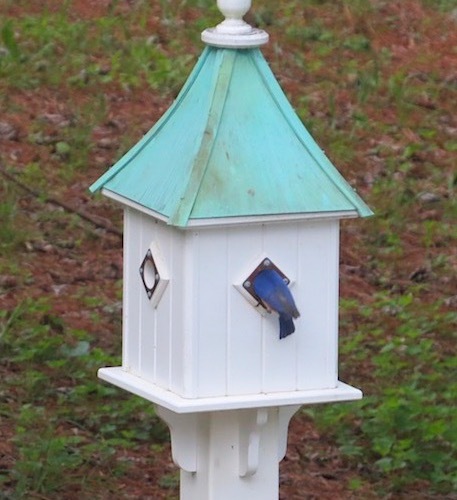 I did this to discourage starlings and other like birds from nesting, but hope to encourage smaller birds like bluebirds (although they are territorial and only one would likely move into a dovecote) and warblers and wrens. When examining design possibilities, I really like this one. I hope the birds get half as much enjoyment from my dovecote as I did making it for them! Edith’s Take: On our walk today we went by a car with ice on it. The ice on the car was very pretty. It almost looked like there was ferns on the car. Funny how little things like this can lead to an inspiration post. Ice is a very pretty thing. Ice can form all kinds of pretty patterns and shapes (like the fern-type shapes on the car this morning). Ice is not only pretty it is all useful in many ways. If we did not have ice we could not survive. Ice refrigerates food, that if it was left out would spoil. Ice is also used to ship food over seas. Back in the 1800’s and even before, when a person had a fever, they would put that person in a bath of ice to keep the fever down. If we didn’t have ice at that time, many people would have died. Ice is also very good for headaches (have you ever had a headache and put some ice in a towel and put it on your head?). Ice can relive pain because it works to reduce blood flow in a particular area which can significantly reduce inflammation and swelling that causes pain. Ice is also used for many different foods including ice cream, smoothies and popsicles! Edith’s Dad’s Take: . Wow. I am not sure I can add anything, but this early American businessman is a very interesting character and features prominently in America’s early ice industry. Edith’s Dad’s Take: Every so often, Edith and I come across a mailbox that is unique. It takes a lot of effort and creativity to take something as ordinary as a mailbox and turn it into an inspiration. This example certainly does just that – it has all the -ahem- “bells and whistles”! Edith’s Take: I agree with my dad……. this mailbox is certainly inspirational, not to mention creative and eye-poping. When you go by most mailboxes, they are usually green, black or brown. A lot of time and thought must have been put into designing and building this unique mailbox! Our Inspiration Today: Mare’s Tails. Edith’s Dad’s Take:. Edith and I have found our weather this summer very inspirational. The cloud formations have been exceptional, with an ever-changing sky, quite a departure from previous summers of more static heavens. Edith’s Take Mare’s Tails, or Cirrus Uncinus Clouds, are clouds that look like streaks on the sky. There can be one or a thousand Mare’s Tails in the sky depending on the type of weather day. The Mare’s Tails are quite pretty. Mare’s tails are caused by high cirrus clouds that have been shaped by the upper winds. Cirrus clouds can signal an approaching front. Our Inspiration Today: Cricket Magazine! Edith’s Take:. I have been getting Cricket for a while now, and I would definitely say it is my favorite magazine for children. Cricket is perfect for kids and young adults who enjoy reading, writing and poetry. Cricket s a collection of stories and poems written by various people. One of the most intersting things about this magazine is the cover art. My favorite cover art was the one on the November/December 2016 issue. Besides Cricket, Cricket Media also publishes a lot of magazines for all ages including Cobblestone, Ladybug and Muse . They even publish a magazine for babies, called Babybug! Edith’s Dad’s take:. Since it’s inception, Cricket has been an imaginative oasis for young readers. For young children aspiring to receive their first ‘very own’ magazine subscription, Cricket is an excellent choice. Edith’s Take: GirlUp is a non-profit charity , dedicated to helping girls around the world go to school and get a good education. They host charity events, pep rallies and fundraisers to raise money for girls around the world who do not have enough money for school tuition. In addition to that they also provide transportation ( such as bicycles) for girls who live far away from their school. Check out GirlUp’s Youtube channel! Edith’s Dad’s take:. One of my favorites, the Horse Chestnut is beautiful when flowering in spring and has a unique shape, look, and appeal in autumn. I always associate it with Halloween as it seems to lose it’s leaves early in the fall season and then takes on a ghastly appearance. The smell of the dried leaves and seed pods under foot have a special aroma of fall, quite unlike other trees. We have found that the tree grows readily from the “chestnuts” – the key seems to be to find ones that have been on the ground for some time and therefore the shells have begun to soften. 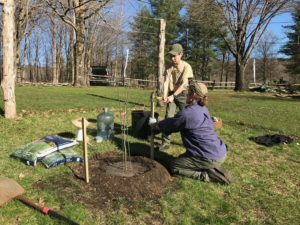 Set in the ground at a depth of about 4″ – 6″, the young tree will appear in spring. The specimen next to Edith in the photograph above was one we planted about 3 years ago. Edith’s Dad’s take:. The Catalpa is a much overlooked tree. We have several examples in Lewisburg, mostly concentrated near small streams and moist soils. When it flowers at this time of the year, it is a beautiful specimen, deserving of our title of “inspirational”. Edith holding a potato plant, which she is about to set in the garden. Edith’s Take:. This year we are experimenting with growing potatoes. When my dad first said “let’s do a inspiration post on potatoes”, I thought he was nuts. I mean what can a person find inspiring about potatoes? But then as I thought about it more, I begun to realize that there is actually many things to find inspirational, but before I go into what I find inspirational about potatoes, let me just say that this was 100% my dad’s idea. According Wikipedia, the introduction of the potato was responsible for a quarter of the Old World population! We also found out that the raw potato is about 79% water-also super cool! Potatoes also come in a wide variety (4,000 varieties :0). Besides that potatoes are super yummy. Ok,ok,ok,ok…… but it is true there are tons of ways to cook potatoes, and none of them are bad ways! Edith’s Dad’s take:. Edith is correct, the potato was my idea for an inspiration. I was inspired yesterday as Edith and I planted some sweet, white, and red potatoes. I find the potato very interesting. First, the seed potato. If you hold back a few potatoes from your fall harvest, they will over-winter and can be planted again in the spring (be careful to select varieties that have not been treated so that they cannot be used as seed potatoes). It is amazing to me that you can take one (seed) potato, cut it into pieces (yes, you can do that as long as you have a couple of potato “eyes” in each piece), plant them, and if the conditions are right, grow several potato plants that will produce a dozen or more potatoes each. Out of one, many. Second, the humble potato is one of the few fruits or vegetables of which I am aware that can be cultivated for several months. Think about it. Most fruits and vegetables we eat are available to us “ripe” for two to maybe three weeks. 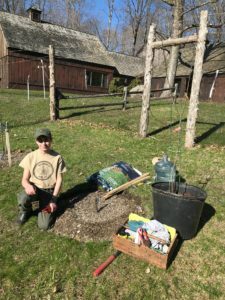 When planted early, you can dig the potatoes you need, leaving the others in the ground, across the span of two or three months, sometimes more depending on your location. This presents incredible flexibility to the cook of the house (which I am). Nothing beats walking into your garden as your pot is boiling and selecting a few potatoes to cook for a dinner side dish. Delicious! Edith’s Take:. The Old Church Yard by Offa Rex is a very interesting piece. My dad heard it on an NPR interview with Olivia Chaney and thought that the song was beautiful, so when he came home, he immediately purchased the song on iTunes. When I first heard it I was like wow a song about someone going to the graveyard. But then I listened to it more and more and I liked it more and more. The lyrics are very deep. The lyrics almost sound as if someone who is dying is singing it. It sounds like the person who might be dying just wants to die and a sick of people mourning for them, they’d rather just go to heaven right then. Olivia Chaney (the women singing the song) is also a very good singer, I like how she has a wide voice range, it makes the song intersting to listen to! The Old Church Yard is definitely a song to add to your music playlist. Edith’s Dad’s take:. Olivia Chaney’s version of this traditional song is stunning, which is exactly what this song deserves. It is an interesting twist that the first stanza – and Chaney’s voice – draws you into a Victorian haze of a Sunday afternoon picnic in the old church yard. The second stanza has the power to set the listener a bit on edge. “Mourn not for them, their trials are o’er” seems at first almost flippant, a macabre laugh at those permanent residents…until you come to understand in the fourth stanza that the author/singer is welcoming death. The third stanza ends on a line with a decidedly double meaning -“When we follow lost friends to the old churchyard”, which sets the listener up for what is coming in the aforementioned fourth stanza. Listen to how Chaney handles “To breathe kind words to a broken heart;”, a musical departure from the flow of the entire song. Perhaps the most troubling line of the song comes in the form of “I’m so weary, so wayworn, why would you retard the peace I seek in the old churchyard?”, as it suggests that the friends of the author/singer are actively trying to prevent his or her death, which also reinforces the earlier notion that the author/singer would prefer that death comes earlier than expected. Of course, my interpretation of the lyrics could be wrong. This song is more than worth your efforts to divine your own meaning. Edith’s Dad’s take:. Thank you, Dave Cover! You make learning the piano fun, interesting, and enjoyable for Edith. I’ve always known you to be patient with your students and it is clear to me from observing your other students at the recital that they enjoy working with you. Dave’s annual piano recitals are the perfect forum and his wife makes the most delicious snacks for the “after party”. Thanks, you two, for all that you do to make the piano a special instrument in the lives of all of your students! Edith’s take: Mozart’s Clarinet Concerto was written in October 1791. Sadly, Mozart died two months afterwards. The piece starts out very light and wavy, but then continues on with what I would call “peaceful dramatic notes”, meaning that the notes get sharper as the piece goes on. The song was popularized after it’s apperience in “Out Of Africa”. It also has a certain gentle roll to it that I like. Very delicate, yet played with alot of sharpness and persision. It was written for clarinetist Anton Stadler, also a famous clarinetist. Edith’s Dad’s take:. Easily one of the most beautiful pieces of classical music. Perhaps the most beautiful part was immortalized in Out Of Africa, arguably the best known of all works by Isak Dinesen (pen name of Karen Blixen). Out of Africa was inarguably one of the best American films of the late 2oth century. My apologies to other worthy films, but I could indulge in Meryl Streep’s fake Danish accent and great outfits throughout the entire movie when -full disclosure – I can’t normally sit through more than about 20 minutes of a movie. Oh wait, this is about Mozart. Great piece. Edith’s Dad’s take: During our last tour of Colonial Williamsburg, we were able to score tickets to an organ recital in the Christopher Wren Chapel on the campus of William and Mary. Construction on this beautiful chapel began in 1695, making the chapel the oldest college building in the United States. The Wren Chapel is marvelous, but we were there for the music. Below is an audio recording I made of the organ playing. Imagine…you are hearing early music of the kind that would have been played in the 18th century, played on an c. 1735 organ restored to sound as it did when it was built! The organ in the Wren Chapel is believed to have been built c.1735 and was found in a barn in England. One of the organists from nearby Bruton Parish came to play for our group, and she clearly relished her time both playing the organ and relating some of the organ’s history. Edith’s take: What is most amazing about this organ is that it was brought to Williamsburg and restored, what time that must have took!!!! It was beautiful to listen to and the organist there was quite talented!! She would stop for brief periods of time to explain about the organ and the history. The organ was built in c.1735!! That has been there for over 250 years!! The original plans to the college date back to the early 1600’s- even older than Harvard which was built and established September 8th 1636 [ My birthday is 6 days before that!!] . The music was lovely and the best part? it wasn’t four hours long, it was only about half an hour- which made it nice for people with young kids [and even older kids]. Edith’s Dad’s take: If you did not get a chance to listen to last week’s Performance Today, host Fred Child interviewed Timotheos Petrin, the Young Artist in Residence. This fascinating young man was born in Greece and traveled to United States to study at the Curtis Institute. Petrin is an accomplished musician (keep in mind he is about 20 years old), but his outlook, philosophy, and deep knowledge of the purpose and power of classical music is what struck me during the interview. Edith’s take: Performance Today is probably alone one of the best radio programs, they talk about different musical artists and play some of their songs. A couple of days ago, I was listening to a program that I really did not care for, but I was board and it was perfect to practice my dance routine to, so I continued to listen [Sometimes even Performance Today can have boring music, no offence to Fred Child.]. A few minutes later the program ended and a new one begun, I begun to climb the stairs to go do something else, when something caught my interest, it was very pretty music, in a few minutes I discovered that the artist was a young college student named Timotheos Petrin. Apparently, he grew up in a music loving family. When he was just 18, he auditioned for Curtis Institute and was fortunate enough to get accepted because of his great cello-playing skills (His mother was the one who encouraged Tim to play the cello after a year of piano lessons). He is truly a great artist, if you want to learn more about him you can go to www. Yourclassical.org/performancetoday. You can even get clips of him playing and the interview between him and Fred Child. Maybe you have discovered you like classical music more then say hip-hop or jazz!!! !